Earlier this year, my husband and I had dinner plans with another couple in Seattle. Since we live in the suburbs, an evening in the city is a big treat for us. On the way to dinner with our friends, we all decided to stop at a wine bar for appetizers. This spur of the moment change of plans was a big hit! We canceled our dinner reservations elsewhere and embarked on a youthful adventure of bar hopping around the city. I was eager to explore the Seattle nightlife because it reminded me of my late night tapas experiences in Spain a couple years ago. 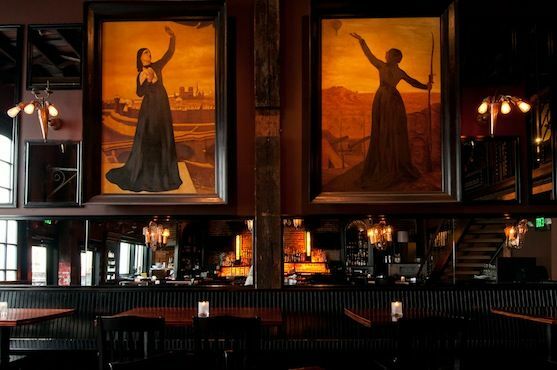 Bastille Café & Bar, one of the hip stops on our bar hopping tour in Seattle. 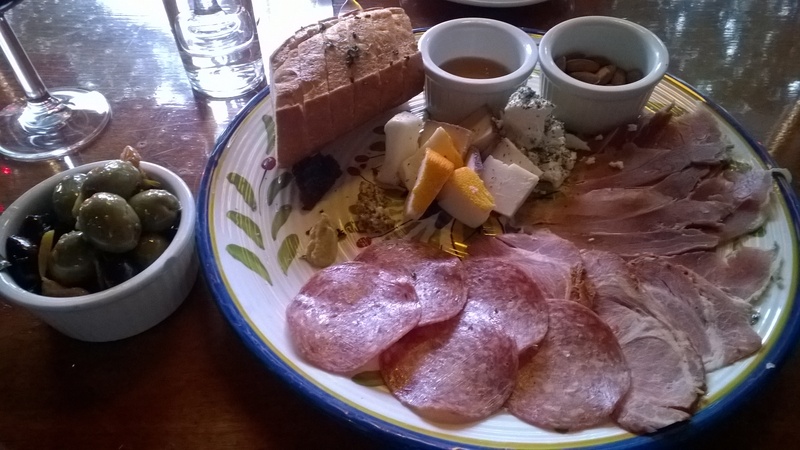 At the wine bar, we started the evening with a dish of olives and a charcuterie tray (assorted cheeses and meats). To drink, I naturally ordered a glass of Spanish wine. Before I ever stepped foot on Spanish soil in the summer of 2013, I was not a fan of olives. I would only eat them if they were buried in my food—like in nachos. And it wasn’t unusual for me to pick olives off my pizza. My family on the other hand, were big olive eaters. I have many fond memories of my sons poking their fingers into olive holes—redefining the meaning of finger foods—and eating them like candy at the dinner table. It was a habit handed down from their father when he was young. 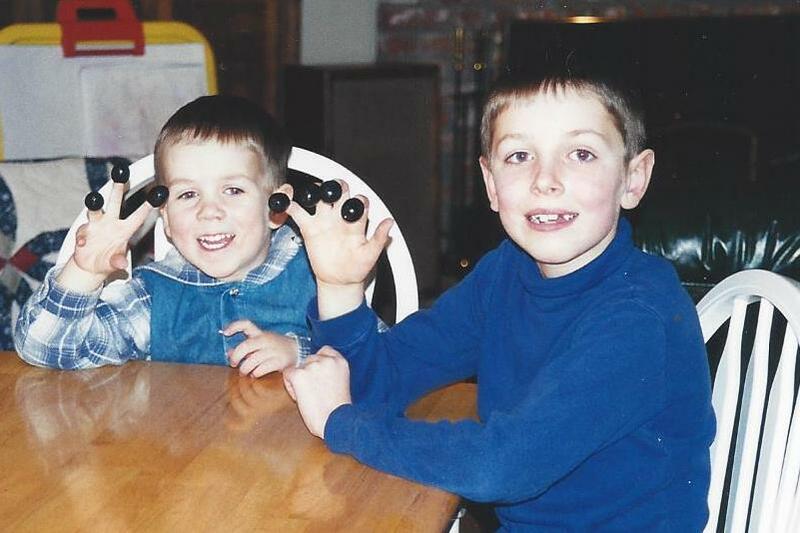 Real finger food, my sons, January 2001. While living in Spain for 6 weeks, I fell in love with olives. Olives in Spain are like chips and salsa are at a Mexican restaurant in America. They often come as a free dish to start the meal. In the peak of the Spanish summer heat, the salty flavor of local olives somehow quenched my thirst. Now olives taste so wonderful to me—the strong and almost bitter explosion in my mouth is so inviting. My new favorite—green Spanish olives stuffed with a clove of garlic. Just talking about olives makes me hungry for one now! Even as much as I love olives, on this particular night with our friends in Seattle, it was the charcuterie tray that really got my attention. It wasn’t the customary cheese and meats that blew me away. It was the little dish of honey that accompanied the tray. I am not a honey type of person. I don’t use it in my tea or use it to sweeten dishes. I don’t generally even like syrup. It is just too sweet for me—and not good for my low sugar diet. 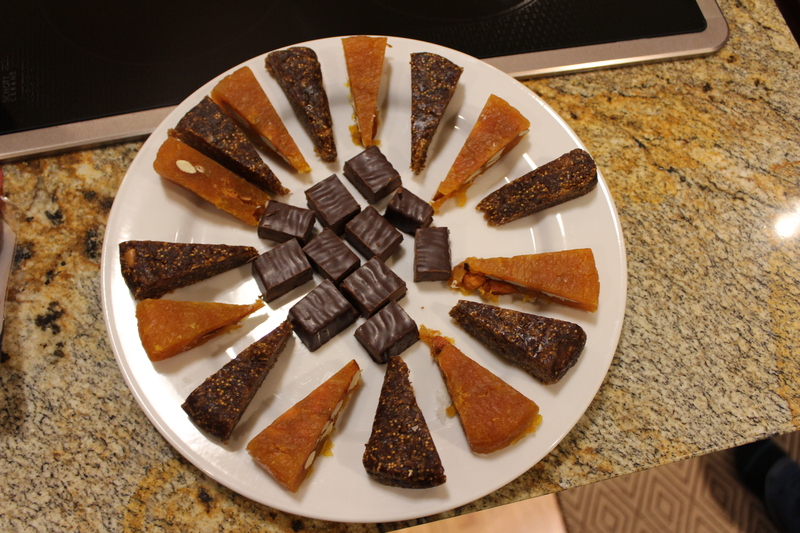 I watched as our foodie friends dipped cheeses and almonds into the honey. I followed suit. Oh my word!! What an amazing taste sensation. I was hooked! Our charcuterie tray and side of olives. It only took a dab of honey to fill my mouth with an explosion of sweetness that seemed to carry me away. It was truly satisfying. We hopped to two other bars for small plates and drinks over the course of the evening. 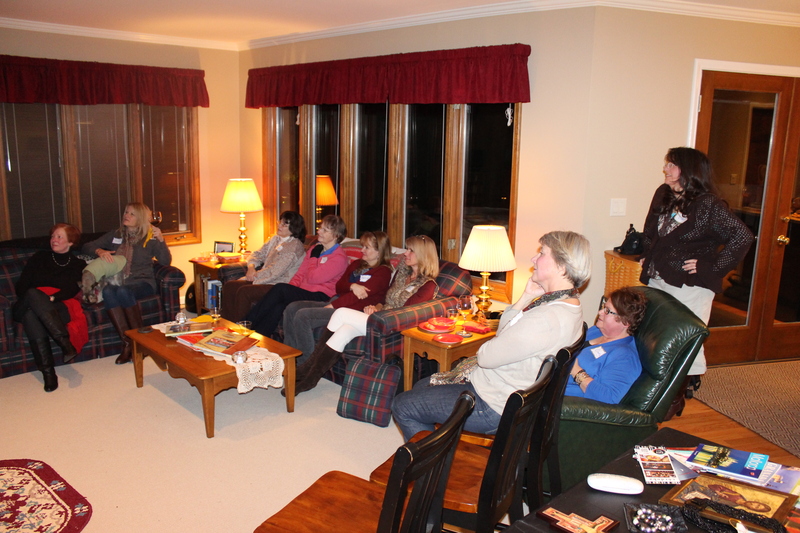 It was fun to be out in the crowd with good friends. My daily dose of honey comes in the form of the Word of God. I’ve had a major renewing of my spirit this year whereby His Word speaks to me in greater ways. He speaks to me in deeper ways. Whether it’s the Word, in times of prayer, or in quiet meditation, I have been energized by this honey that nourishes my soul. It has a sweetness that makes me want to savor it. A single Word from the Lord is enough to turn our day or our life around. Just think how much a dedicated time of prayer and Bible reading can sweeten our attitude and dissolve our bitterness. I recommend any of the above resources to get a dose of sweetness for your soul. What about you? 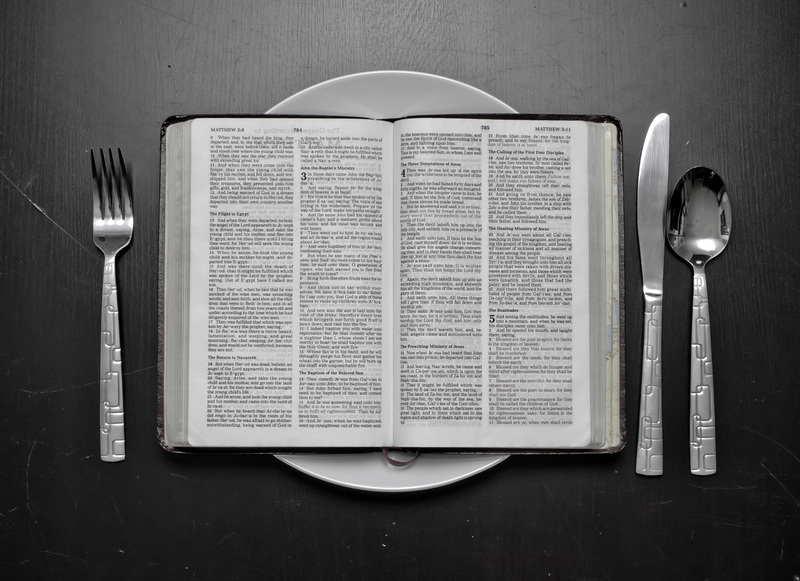 What are you doing to satisfy your sweet spot and hunger for the Word? I can sum up 2013 in one little word, S-P-A-I-N! It changed me. It’s a part of me—past, present and future. So with that in mind, I end my year of blogging, with one final Spanish post. It is sort of a trip in review, with videos and photos that I haven’t previously shared on my blog. So I’m inviting you to join me, and a few of my friends, on a private tour of Spain. Tourists (guests) on a private tour of Spain. Five months to the day I left America headed for Spain, I embarked on another Spanish adventure. This time I was joined by a small group of friends who were eager to experience Spain for themselves. We didn’t physically travel to Spain, but we did all have a Spanish adventure. Last summer I spent 42 days in Spain living with Pedro’s family—a reverse exchange program, so to speak. It was a journey three years in the making, after first hosting Pedro in our home in Seattle. Since my published story in Journeys to Mother Love included this family, my trip to Spain was avidly supported by my friends and family. So naturally I wanted to personally share my experience with them. A table full of Spanish souvenirs. I called this four-hour extravaganza “My Spanish Fiesta.” It was partially in celebration of my birthday, but mostly it was geared at immersing my friends and family in Spain. Together we explored the sights, sounds, and tastes of Spain. Other notable Spanish sights for the evening were the Spanish flag hanging on the wall and a table full of souvenirs from my trip. 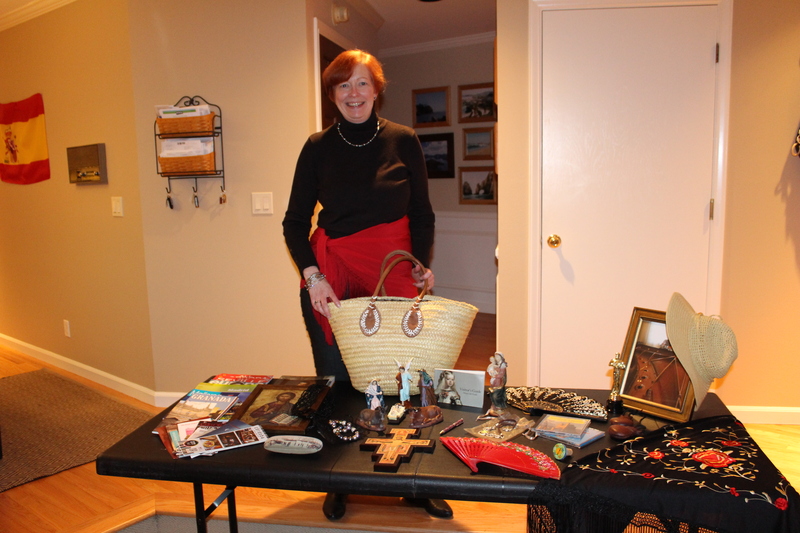 I collected books, jewelry, clothing, hand-painted fans, ceramic pottery, religious statues and mementos, a leather purse, and much, much more. I was good for the economy of Spain. “The economic crisis is over,” Pedro declared after seeing everything I bought. 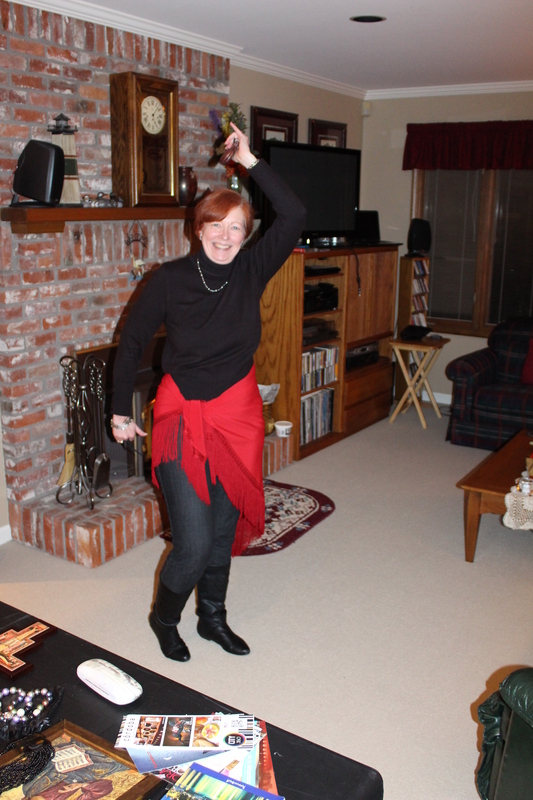 Demonstrating the use of castanets, a familiar sound with traditional Flamenco dancing. Most of the videos included Spanish guitar music by Narciso Yepes and Paco De Lucia, from CDs that were gifts given to me by my Spanish family a few years earlier. Two of the videos were accompanied by Pedro’s original compositions, one of which was composed while I was in Spain. When the videos weren’t playing, Spanish music was still filling our senses. And what kind of music manager would I be if I didn’t also treat my guests to an exclusive video clip from Pedro’s first movie soundtrack, Sed de Amor (Thirst for Love). When the song “The Last Tear” played, it brought a tear to my eye, just like it did the first time I saw it at my private viewing with Pedro’s family. 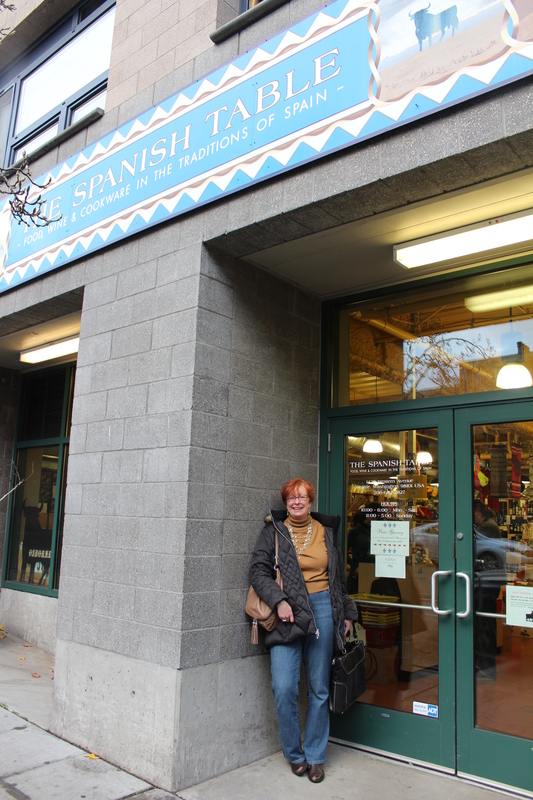 Shopping for culinary treats at The Spanish Table in Seattle. The biggest hit of the evening, and hardest part to pull off, was the food. Since I’m a novice in the kitchen, I usually defer to my good friend Stacie to make the culinary delights for my events. Using a Spanish cookbook I purchased in Madrid, we carefully chose a varied menu of tapas (small plates) to tantalize my guest’s taste buds. 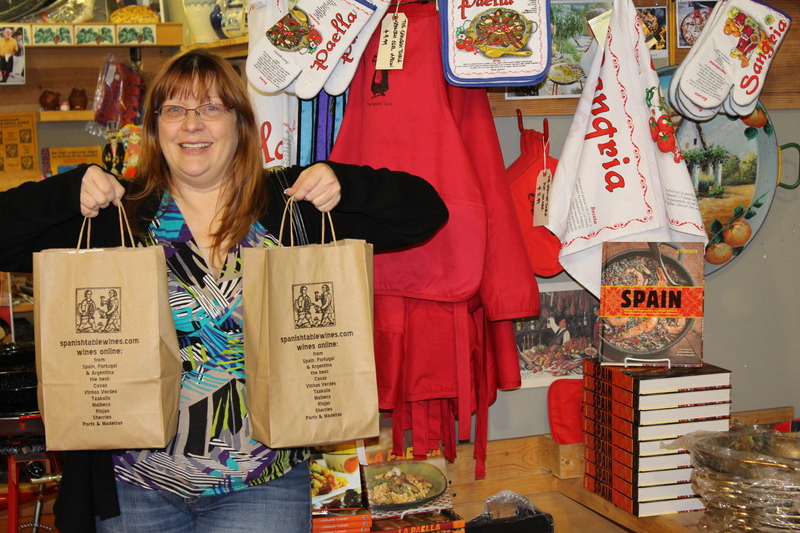 My friend Stacie joined me for a successful shopping trip at The Spanish Table. Since my husband truly is ‘el rey de la cocina’ (the king of the kitchen), especially after the recent remodel, he had a major role in the cooking as well. 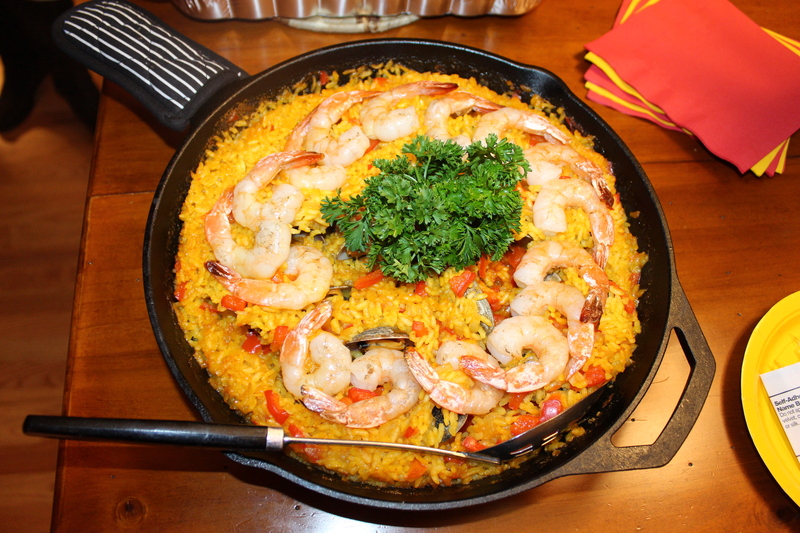 He made spicy gazpacho and paella to eat, and Sangria, to whet our appetites. Other tapas included Pan Amb Oli (ham, tomato, olive oil and bread), Mediterranean grilled vegetables, eggs stuffed with tuna, goat’s cheese and onion, and skewers of olives, sundried tomatoes and Spanish cheese. Goat’s cheese with onion served on bread. Dessert ended with an assortment of Spanish cheeses, quince spread (similar to jelly), fruit and nut breads, grapes, and chocolate turrón. It was just the light touch we needed to cleanse our palettes for the evening. Magnifico! Fruit & nut breads with chocolate turrón. 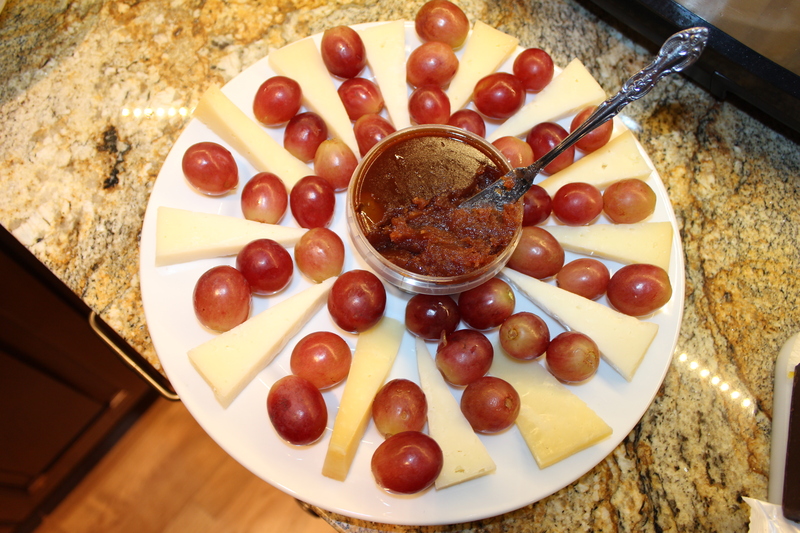 Spanish cheeses, grapes & quince spread. That was my fiesta in a nutshell. Imagine how it was to savor each morsel and be immersed in the sights and sounds of Spain—without the language barrier, of course. It was a lot to take in, as was my 6-week journey. There are many times that I still can’t believe I was in Spain this past summer, or that I was there for so long. It is like a dream. 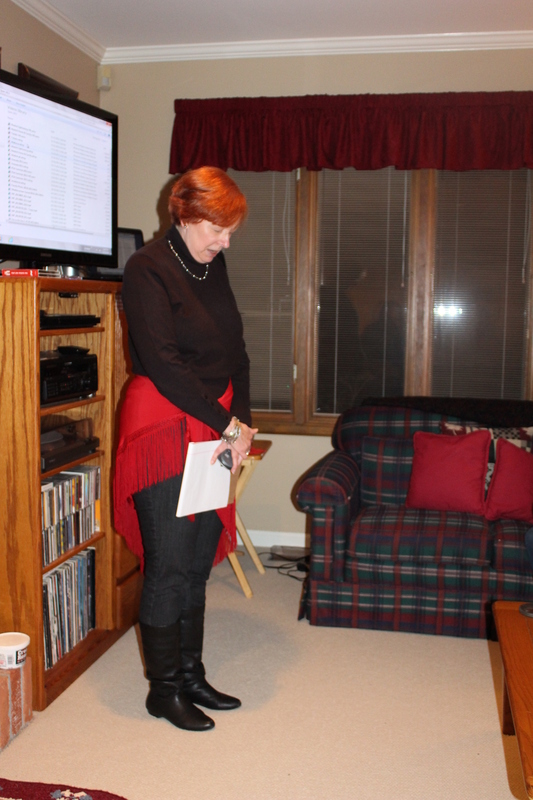 Dedicating the evening with an opening prayer. I owe a huge debt of gratitude to my husband for manning the fort while I was gone, and also to him and my sons who suffered through the remodel of our kitchen and two bathrooms at the same time. Of course, I am deeply indebted to my Spanish family, to whom my fiesta was dedicated. What happened in Spain in 2013 is behind me, but that trip laid the groundwork for what lies ahead. God is aligning me with new Spanish connections and planting new visions and dreams for future trips. In the meantime, I am preparing myself internally for what God wants to do through me here or abroad, and taking one day at a time. Thanks for joining my little tour of Spain. 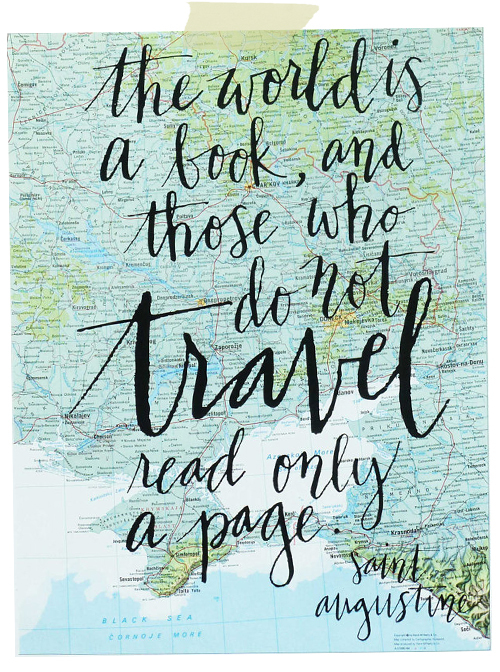 I hope you get the opportunity to travel there yourself someday. If you do, by all means, let me know. I’d love to compare notes. Adiós, mi amigos. See you in 2014! Pan Amb Oli, served with Iberian ham, a Spanish delicacy. *Jamón Ibérico is made with an ancient breed of pig found on the Iberian Peninsula. These pigs, known as “Pata Negra,” are believed to descend from the prehistoric Mediterranean wild boar. These unique pigs are capable of storing more fat, which enables Jamón Ibérico to be cured much longer than traditional ham, resulting in an intense and complex flavor with an unparalleled note of sweetness. The nuttiness of this ‘meat butter’ comes from the pigs’ exclusive diet of acorns. For the most part, eating is an experience in Spain. The way they approach meals is very cultural. In America, our meals are often a rushed experience. In Spain, lunch and dinner are a sit-down family experience, or one reserved for gathering with friends—especially dinner. Americans consume vast amounts of fast food. We also use a lot of pre-packaged or prepared foods in our cooking. In Spain, the ingredients are fresh from the market. For instance with so much bread in their diet, they buy a fresh loaf almost daily. (Bread is to the Spaniard like rice is to the Chinese.) The bread comes from a bakery—no Wonder Bread, or other similar sliced and mass produced bread. 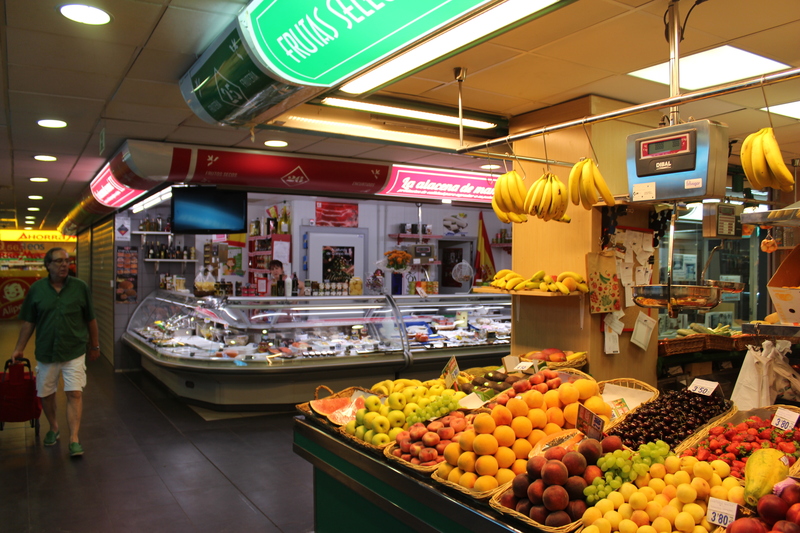 Fresh food in the local neighborhood market, Madrid. Since olive groves are plentiful throughout the country, it is only natural that they use olive oil in so much of their cooking. The main use of olive oil in my American home is in the summer when we douse our vegetables in olive oil before grilling them on the barbeque. It is a taste sensation. In Spain, I use olive oil to fry my very American egg breakfast, to drizzle on my bread at dinner or for a vinegar and oil salad dressing. 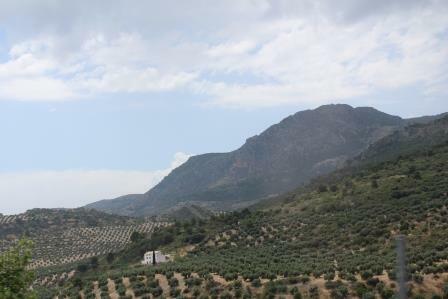 Olive groves in the mountainous region of Andalucía, southern Spain. 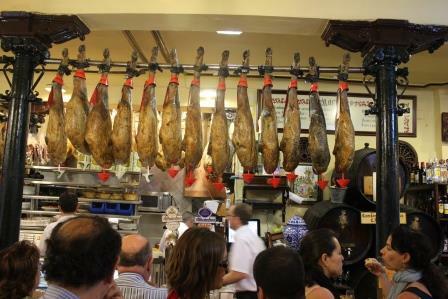 The most common meat in Spain is ham. But don’t picture the traditional American Thanksgiving or Easter ham. This is a totally different type of ham (jamón). This ham has been cured in special seasonings and is then thinly sliced—like paper. I can only remotely explain it as a sort of cross between bacon in flavor (but not cooked like bacon), and salami in consistency. It is everywhere and visible in restaurants or markets with the leg of the pig hanging upside down from the ceiling. I ate this delicacy before ever realizing how it was prepared, etc. 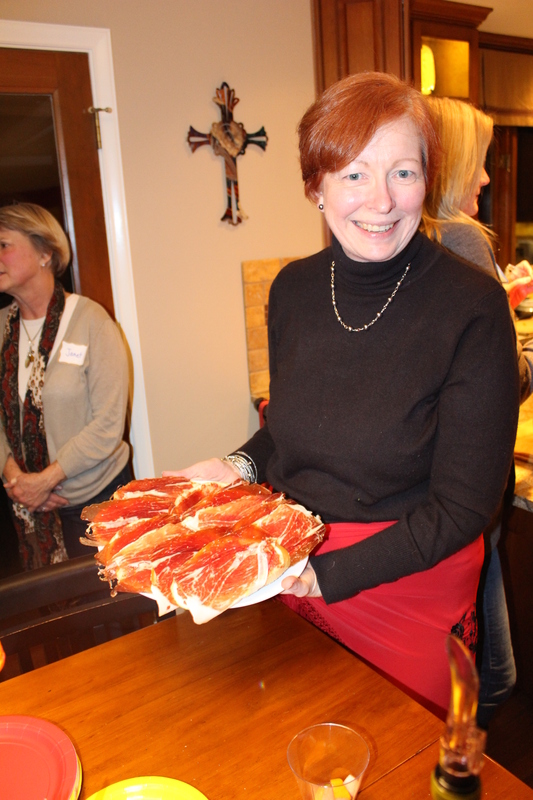 The ham and bread (jamón y pan) are a staple of the Spanish diet. 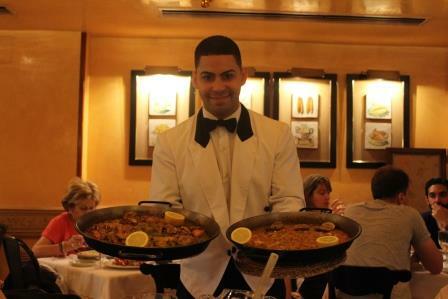 Other popular Spanish foods are paella—a Spanish rice dish usually prepared with seafood or chicken and gazpacho—a delightful chilled tomato based soup (my personal favorite), and one that Pedro introduced to our family on his first trip to America. I occasionally add this to our American summer menus. 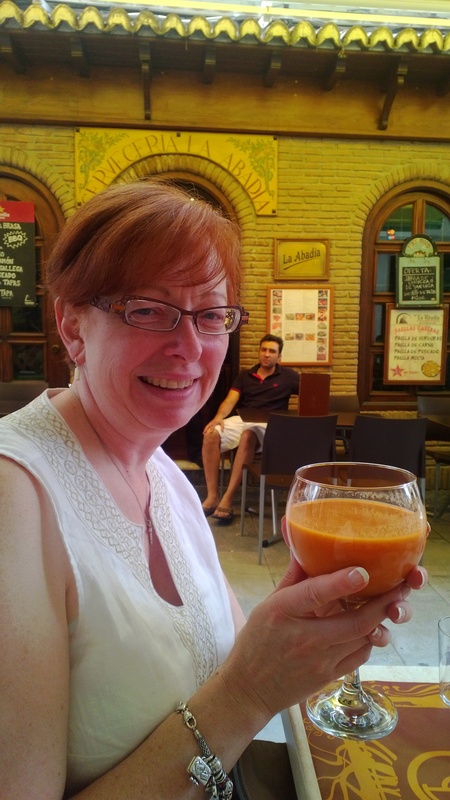 I was delighted to find gazpacho available in refrigerated cartons in the market so I can still enjoy it while living on my own these last few days in Spain. I’ve done a lot of traveling during my five weeks in Spain. It has given me a feel for the food in different parts of the country and lots of opportunities to have tapas. 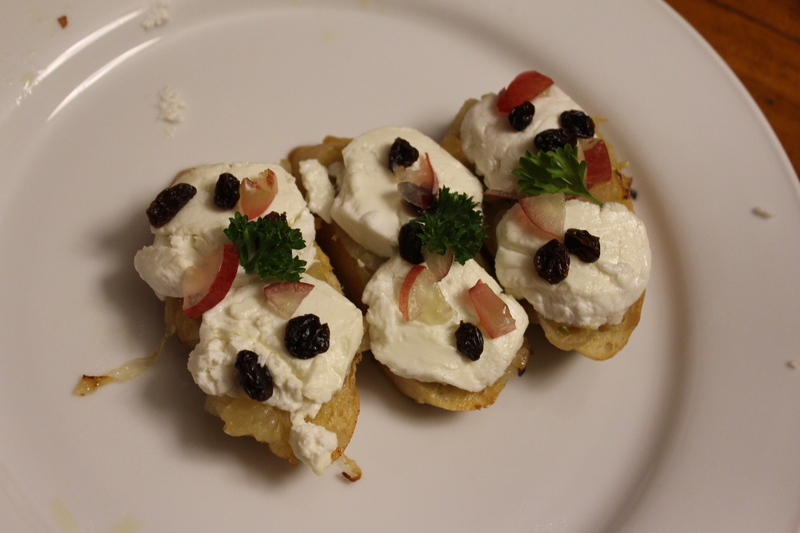 Tapas are similar to what Americans would consider appetizers. Most restaurants have a full tapa menu as people order multiple tapa dishes and share them amongst the table. It is a feast of tasting different flavors, and different types of food. 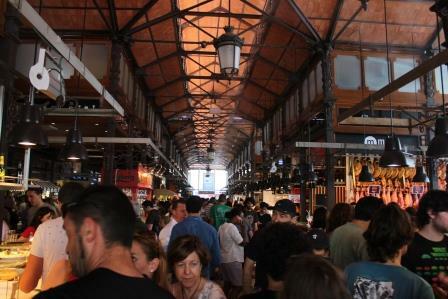 San Miguel Market, Madrid, a popular tourist location for tasting Spanish food. I bravely decided to try everything I was offered—even if I didn’t know what it was. It made for some interesting food experiences. I’ve truly enjoyed some foods I never would’ve considered trying if I knew what they were—like black pudding. On another outing, I ordered bull’s tail for lunch. I’ve also had octopus (not sushi like in Seattle), Vichyssoise, a French soup served cold, made from potatoes and leeks and foie pate, a meat paste made from duck liver. Sangria, a refreshing wine drink with fruit. The Spanish also like their alcoholic drinks. I’ve sampled and routinely drank many of these. 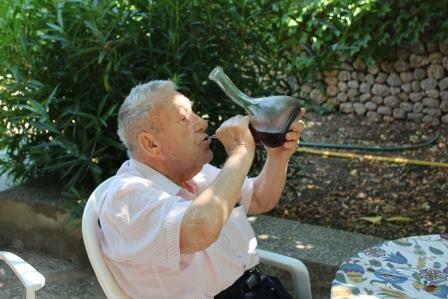 One of the main surprises to me is the way Spaniards consume their wines. I had heard wonderful things about Spanish wine. Living in the wine country of the Pacific Northwest I expected to taste many wines—as a compliment to my food, like I do in Seattle. In the circles I traveled and parts of the country I visited, that was not the case. In other words, wine was not ordered based on what food we were eating. 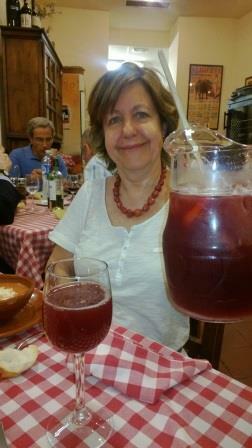 The alchoholic beverage most served with a meal was either cerveca (beer) or tinto de verano (summer wine). Summer wine is basically a red wine with a 7-Up type of cola added. It was very refreshing. Drinking summer wine from a porron bottle. Everywhere I travelled and every time I tried something new or unusual I took a photo of the food or the setting. So I’m including some of my food adventures for your virtual eating pleasure. My last week in Spain is already here and I’m living on my own in an apartment with views of the Mediterranean. It is amazing. 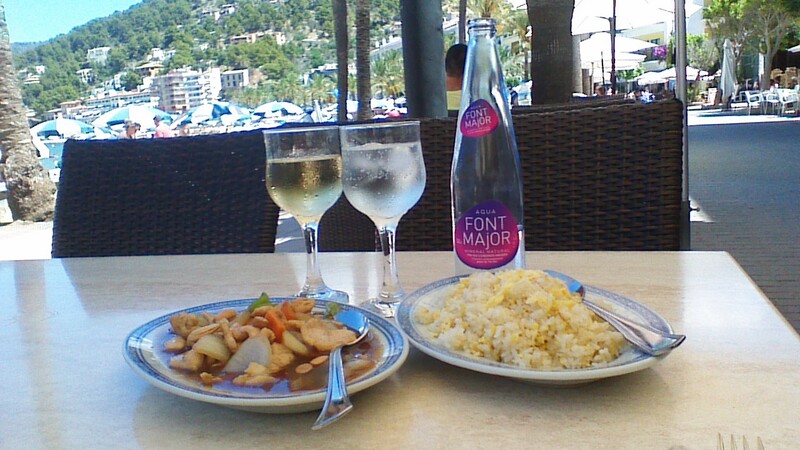 I am writing this at a Chinese restaurant (for a change of pace and taste) along the beach overlooking the Port of Soller and my apartment home across the water. The food is Chinese, but the view is Mediterranean. ~ If this is your first time visiting my blog, you can start reading about my Spanish travels here. Writing doesn’t come easy in Spain. In fact, it seems that not much of anything comes easy for me here. That isn’t at all an indictment of the family I am staying with or the Spanish life. It is just an indication of how different everything has been for me to adjust too. Grateful to be reading chapter upon chapter of this part of the world. Sure I am having the time of my life. I am seeing amazing historical and religious sites. I am living with a family that I adore. But with a mid-life body, an American way of life that is entrenched in me, and having a 5,300-mile and a nine-hour time difference between friends and family, it has been hard to adapt. I have come to realize that there are so many things that we take for granted in the US. We don’t think about how different everyday life is in other parts of the world. Most Americans don’t get an opportunity to experience living in a foreign country. Those that do are generally doing it through a work requirement, a missionary trip or as part of an educational exchange program. In light of that, I thought it would be of interest to share some of the adjustments I had to make to live in Spain and a few differences between our two countries. One of the biggest adjustments for me has been the food. A few months prior to my trip, I made radical changes in my diet to get healthier—doing a cleanse and eliminating allergens like wheat and milk. I was amazed at how much better I felt. I knew it would be difficult to maintain this new diet, especially since bread (pan) is such an integral part of the Spanish diet. The first few days I declined the bread, but that didn’t last. Drinking gazpacho, a chilled tomato based soup. Now I am embracing and experiencing all of the Mediterranean food I can, eating things I’d never dream of trying in America. I have many favorites including some that Pedro prepared for us in his previous stays in our home, like gazpacho. My food adventures will be fodder for another full blog post though. İEs muy delicioso! Another radical adjustment for me has been adapting to the heat. Thankfully I leave for the Balearic Islands and cooler temperatures in two days. 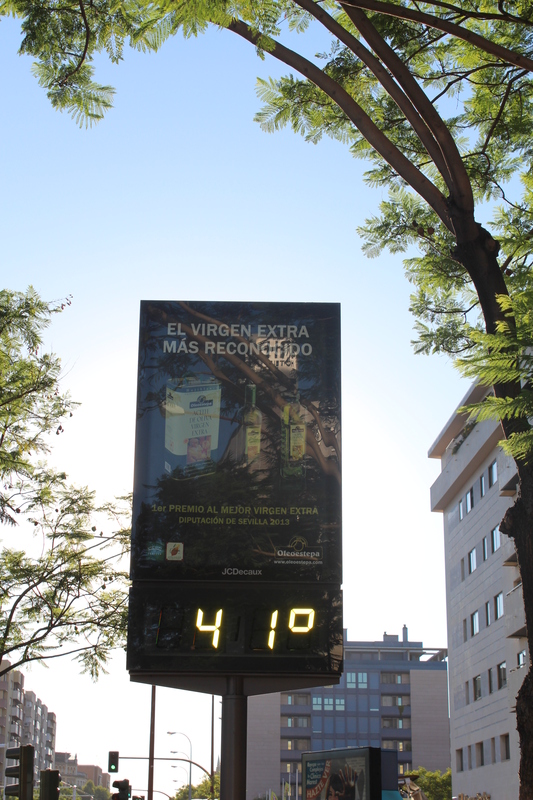 Hace calor! 104 degrees Fahrenheit. For me, it hasn’t been just a matter of adjusting to the heat, it has also been staying hydrated. We have been out sightseeing almost every day. I finally wised up to carrying a bottle of water (aqua) with me whenever I leave the flat. By the time lunch rolls around at 2PM—another adjustment—a chilled beer (cerveza) or glass of summer wine (tinto de verano) is in order to quench my thirst. Unlike America, air conditioning isn’t as available–including the cathedrals and monuments I’ve visited. At night I sleep with the windows open and a ceiling fan running—the same as I would at home in Seattle. A shower doesn’t seem to help during the day either as I’m sweating as soon as I dry off. 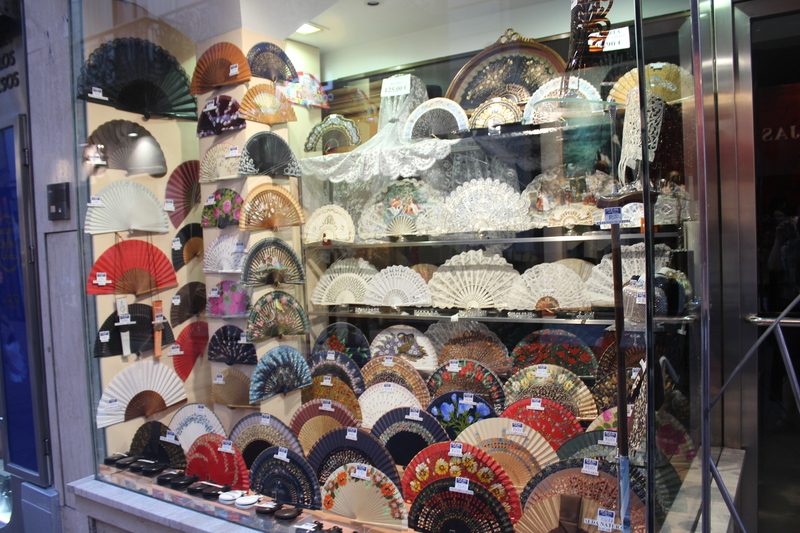 One way women keep refreshed in the heat is by carrying a fan (abanico). I carry my fan with me everywhere I go, a gift from Rosa a few years ago. I’d probably stand out like a sore thumb in the States if I used it, but here, it is a common site. The best way to avoid the heat though is by taking a traditional siesta (afternoon nap). The siesta doesn’t necessary require sleeping, but is used to relax in other ways as well, to read the paper, watch a movie, etc. It is a way of slowing down and not doing activity during the heat of the day. Most shops even close a few hours in the afternoon due to siesta. Only tourists and those unfamiliar with Spanish custom would dare be out in the streets at that time of the day. I love siesta and how recharged I feel when I awake. Hopefully that gives you a feel for some of the differences. Stay tuned for more information about the Spanish lifestyle and sights of this amazing country–my home away from home for three more weeks.